Poaching is a great way to cook boneless, skinless chicken. No oil or fat is required, and yet the end result is a succulent and flavorful low-fat chicken worthy of any recipe. To poach a chicken, you simply cover several chicken pieces with water and allow them to simmer on top of the stove until it's completely cooked through. Doing this at a low temperature allows the chicken to cook gently without getting overcooked. Use poached chicken for sandwiches, as a filling for chicken pot pies, in burritos, and on top of salad. Think about all the recipes you'd use store-bought rotisserie chicken with for more ideas. The advantage of poached chicken is that it's lower in sodium and is most likely a bit moister than a rotisserie chicken that's been sitting under a heating lamp for a few hours at the grocery store. In fact, this is one of the healthiest ways to eat chicken—and it doesn't leave it dry or flavorless. Your poaching liquid can be as simple as plain water. Admittedly, this doesn't add flavor, but your chicken will be succulent and tender, and perfect to use as a base for a number of recipes that call for cooked chicken. Instead of water, however, some people choose to use chicken stock to poach, but that can increase sodium levels. One happy medium is to use water and mix in vegetables and seasonings to allow the chicken to soak up tasty flavors. You could also try a fat-free and low-sodium broth, white wine, water infused with fresh or dried herbs, fruit juices, or even light coconut milk. The key to poaching is in the size of the pan, the volume of liquid, and the cooking temperature. Place chicken breasts in a pot large enough to fit them in one layer. Two medium chicken breasts fit snugly in most 2-quart round pots. Add poaching liquid so that it completely covers the chicken by at least 1/2 to 1 inch. After bringing the liquid to a boil, reduce heat to a bare simmer so that only an occasional bubble breaks the surface. At this point, partly cover the pot, cook for about 10 minutes, then turn off the heat, leaving the chicken to finish cooking in the hot water for 10 to 15 more minutes. Remove the chicken; enjoy it warm or refrigerate it for later use. 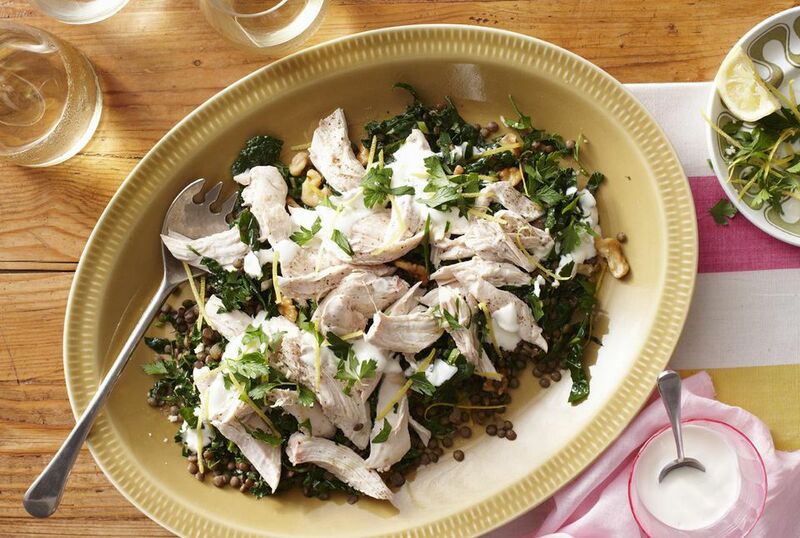 Slice or shred your poached chicken depending on what the recipe calls for. If you're not sure what recipe you're using your poached chicken in, keep the healthy trend going with some fresh, low-calorie vegetables. Obviously, you have to consider some simple green vegetable sides like roasted broccoli or cauliflower, green beans or peas, or asparagus. Simply mix a little salt, pepper, and garlic in your veggies for seasoning and you're done. You could also add a baked potato, side of red or white beans, or a salad—like coleslaw, earthy lentils, or grilled pineapple.